Finally got around to posting my slides from both the Game Designer's Rant and my Immersion talk. You can grab them over on the right along with all the presentations I have ever done. You don't need my permission to give these presentations to your coworkers or students or do whatever the hell you want with them. I'm very pleased at the feedback and the criticism I've received from both talks, which I will summarize briefly here. It seems like the feedback from the Rant is overwhelmingly positive. I am kind of surprised by that. I expected a few more people to at least challenge the premise that we can make games about concepts like honor or trust. It seems like only a year ago (never mind five) people who suggested such a thing were considered a little bit weird. Last year - putting forth similiar ideas in my exploration talk - I think there were still a lot of people who thought those ideas were a bit flakey and out of touch with production reality. Now it seems like we are ready to simply accept as a fact that we can make games about these sorts of feelings and ideas and get on with the challenging business of doing so. A lot can change in year in terms of our attitude. Let's hope as much can change in a year in terms of our execution. For those looking for other ranter's slides and materials - I found Jane McGonigal's stuff here. If you find others let me know. There seem to be three camps in terms of how the immersion talk is received. The first camp seems to have found it an inspiring and insightful talk and were apparently more than willing to overlook the (many) omissions, errors in reasoning, and lack of structural support for some of the bolder arguments. 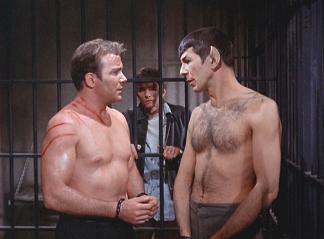 Apparently there is a lot to be said for covering up the faults in your reasoning with Kirk-and-Spock jokes. To those in the first camp, I would suggest you read a bit deeper and look for some of the flaws - they can be illuminating. Immersion seems to be a powerful tool that is easy to use badly or for the wrong reasons. This talk was never intended to be a promotion of immersion (neither a criticism) but rather a deconstruction and examination of immersion and the techniques used to induce it as formal tools. An excellent starting point for looking deeper into immersion is Rules of Play by Eric Zimmerman and Katie Salen, which was an invaluable resource for me in preparing the talk (in particular refer to Unit 3: Play, Games as the Play of Simulation) - thanks Eric and Katie. The second camp seems to have caught on to the weaknesses to a greater or lesser extent, but has been generous in attribution of value to the talk as a whole. Quite a few people have said they thought I was 'cheating' my reasoning in a number of places but were nonetheless happy to have any kind of formal examination of a topic that we too often take for granted and pin to the wall as a project objective without consideration for what it means. If nothing has been accomplished with this talk aside from helping this group of people avoid some of the mistakes I have made blindly in the past, I'm more than happy to accept their grace in excusing the weaknesses of the talk. Thanks for not kicking me when I was down. This camp could be called the 'glass-is-half-full' camp. The third camp would then be the 'glass-is-half-empty' camp - and that's the camp I would put myself into. We are the ones who wanted this talk to be more than it was. We wanted it to be 55 minutes long instead of 35 minutes long. We wanted it to have a middle where the loosely formalized tools of the first part were examined in context and used to expose where existing games may have stumbled or excelled in their application of immersion. We wanted all of that to fit together well enough to justify a hand-wavey ending that - if it can be compellingly demonstrated - is in fact a really, really important notion. I have spoken to many of the camp three people at length and they have helped me see how and where the talk falls short. A number of interesting suggestions were made as to how I might tie off some of the squirting arteries dangling from the disembodied heart of the talk. For now I'll just pinch them off and toss that heart back into the simmering cauldron of my subconcious where it can stew for a while and maybe eventually I can patch the talk with the middle that it probably deserves. Anyway, thanks especially to the group three folks for kicking me when I was down... you can never see the root of a problem until your head has been thoroughly stamped into the dirt. I'll try to follow-up over the week with some more of my thoughts about GDC as a whole. "The mechanics of trust are not harder than simulating rope..." from your rant... there are a couple other gems, but this one was (I think) THE one. Very well! Agreed and quotable. I had a similar experience with Ico. When the bridge breaks, I reacted instinctively as if I could turn around and reach for the girl/ledge. It wasnt until the second play through that I figured out that it was just a cutscene. Now, that was Ico, a classic in which the force feedback doesnt trigger when you step on the ground, but does when you tug on the girl's hand. That mechanic (not trust... CARING) is implemented through gameplay for the entirety of the game; at least that's what i felt => caring. Or at least, which one would you love to attempt? What's great about Passage is that for me it wasn't about time/mortality but sharing ones life with someone. When my companion died, I suddenly felt very alone and I didn't want to leave the grave stone at all. I knew, looking at my character that my time was about to run out and I said, "What's the point? I don't want to leave her here, I'll stay." That moment, of feeling alone and not wanting to leave my companion really hit me personally. I also agree with Ico and I'll throw in Shadow of the Colossus for the same reason. Hey Clint, your lecture on immersion was one of the highlights of GDC for me. It's been a while since I've seen a lecture which was both as informing and entertaining at the same time. Reading the comments here makes me wish I went to the rant as well, but thankfully the audio track should arrive one of these days. I really enjoyed both your lectures! As usual, you've raised a lot of interesting questions. I do have a question about the rant though - like Purum mentions above, I too found the line about trust to be quite compelling. However, in the real world, concepts like trust and honor work because they entail real risks with real consequences - doing the 'honorable' thing means a real sacrifice with real pain. How can that sense of real consequence be engendered in a play experience, when the whole notion of play is in creating an artificial safe space? Is it just a question of immersion, i.e. convincing the player that there are real consequences to his actions? "doing the 'honorable' thing means a real sacrifice with real pain. How can that sense of real consequence be engendered in a play experience, when the whole notion of play is in creating an artificial safe space?" Too many assumptions there. Why sacrifice? Why pain? Why real? Artforms create, express, evoke and transmit feelings, emotions and concepts without making them harshly real to the receiver (or, hopefully, to the creator). As for games specifically... Why a safe space? Does Passage provide that, since you are going to die anyway? What games need is to break free from the tradition that the only possible consequences are either success, or death and restart / reload. Just questions, I don't have the answers. The Game Designer's Rant seemed to stand in stark contrast to the "Prototype" presentation and in juxtaposition, your talk in particular left me wondering if it really is currently possible, is it really true or is it just wonderful wording that "The mechanics of trust are not harder than simulating rope..."? Does it boil down to mechanics or desire or something deeper—culture? I was reminded of all the old Westerns, definitely with battle as a central theme but John Wayne always did seem to epitomize honor or at least that generations' ideal of the masculine. Do we hold the same ideals...for masculinity, for conflict, or even is honor an ideal? Beyond that can games as a medium have that power? And if so what does that REALLY mean? All important questions... Love to have you speak at Champlain—we're finally gotten to the place where we're trying to create those answers—and the students are teaching me that I have only more difficult questions. PS thanks for your blog! Yes - I strongly believe that it is currently possible, and am working hard on trying to prove it. Regardless - you understand how difficult it is to simulate rope - right? This is an absurdly difficult problem that we have only even come close to doing well in the last 5 years or so, and still, because it is more an engineering problem than a psychological one the complete SIMULATION of rope might be easier - but the simulation of the MECHANICS of rope might even be HARDER than the simulation of the mechanics of trust. A typical 20 dollar budget-ware poker game for your phone will include AI driven trust simulation within a fairly constrained domain. The rope simulation in SC:CT is similarly constrained. Why not make games where what matters in the player-rope-AI chain is not the strength of the rope, but the strength of the relationship? Yes we can do it today. How well? Well - no one really knows because no one is trying. Is honor an ideal? Well - if your measure is that we're not making any games about it, and therefore maybe it's not something people today care about - I would counter that since we're not making games about much at all, then your argument extends to complete cultural bankruptcy - since we don't make games about anything we must not care about anything. Clearly that's not true. While maybe honor is not the most important cultural value of our times, that doesn't mean we couldn't make a game about it. It only means maybe it won't be terribly profitable. Can games as a medium have that power? You tell me. You're the director of a program granting degrees in game development - if you think games can't have that power I'd suggest you're in hot water ethically speaking:) But I don't think you have much to worry about. I think your question is rhetorical and you know the answer as well as I do. What does it mean that they do have that power? Well - I suppose that today it means that we have a responsibility to ensure we develop an industry that wields that power responsibly. This is kind of late. I'm a casual games writer/designer from Manila and I also teach game design part-time in a university here. I just wanted to tell you how much I loved your rant at GDC (my favorite of the conference), and that I'll be recounting it to my students in class this week. We'll be taking up the dramatic elements of gameplay, and my ulterior motive is to make the students care about creating meaningful stories and themes in their future games.